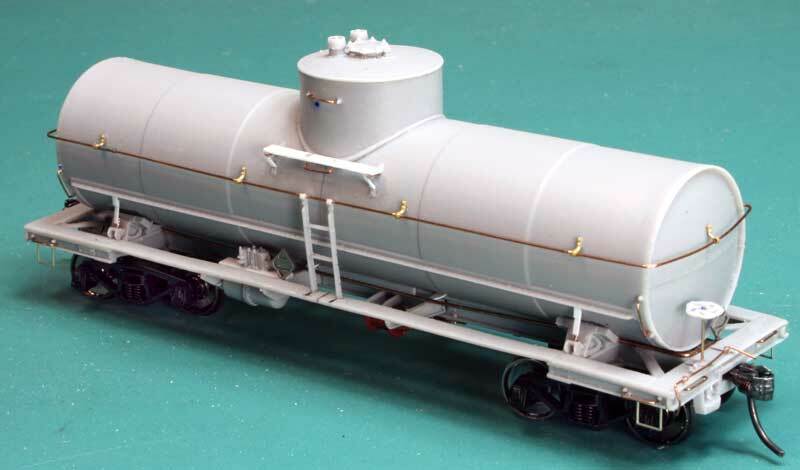 Resin Cars Works is pleased to announce the release of our sixth kit; Insulated AC&F Type 27 Class 103/104 tank cars! The first series of kits have 10,000 gallon tanks, which were generally used in the transport of asphalt. Decals have been produced to offer the standard Shippers Tank Car Lines lettering and for lessees Paluxy Asphalt, Cities Service, and United States Rubber Company. These tank car models have not been available as HO scale kits and are produced from completely new masters. The frame is a one piece part where only the details need to be applied. The tanks and domes were created as 3D models to ensure that the various dome sizes and tanks fit. Decals were created directly from prototype images. The kits are composed of cast resin parts, decals, cast brass parts from Precision Scale Company, etched parts from Yarmouth Model Works, plastic parts, wire and grabs from Tichy Train Group, and appropriate truck side frames from Tahoe Models. These kits are $65 each, plus shipping and Illinois State taxes, if you happen to live in Illinois. Check the Kits page on the Resin Car Works website for prototype photos, model-specific details, and an order form. Other tank sizes and lettering schemes of these insulated tank cars are future release possibilities! I have a question, on the United States Rubber photo, the word Latex is displayed. On the graph that shows what commodities were hauled in the cars, it has Asphalt for the United States Rubber car. So, which was it, Latex or Asphalt?